OFFER: 5-Pack of Hand-Blown Clear Glass Refillable, Long-Lasting Tea Light Candles Including a Small Plastic Funnel for Effortless Refilling. Dimensions are approximately 1-1/2 inches wide by 1-3/4 inches High and may vary by 1/16". Firefly tea lights are the same width as standard tea lights; however, they are taller. Be aware that if the height of the flame touches or is extremely close to a solid surface (e.g., a teapot), smoke and soot will occur. HOW TO USE: Use Our Clear, Unscented Liquid Reusable Tealights in UCO Candle Lanterns, Essential Oil Warmers, Oil Burners, a Glassybaby, Diffusers, Morrocan Lanterns, Tea Light Holders, Menorahs, Lotus Candles, UCO Mini Lanterns, UCO Micro Lanterns, Wine Bottle Tealight Candle Holder - Great Alternative to Disposable Wax Tea Light Candles. One of the best features is that you can control the height of the flame and the amount of heat just by increasing or decreasing the exposed wick. RECOMMENDATION: Our Firefly Tealight Candle holds about 1/2 Ounce of Fuel. Burn Time is VERY DEPENDENT on the Type of Fuel You Purchase and the Height of the Wick. Therefore, in our experience, you can expect 4+ hours using Firefly CLEAN Lamp Oil. If you require a longer burn time, I would suggest purchasing a Firefly Votive or Pillar Candle. Be sure to review our USER GUIDE PDF under Technical Specifications on this page below. COLOR YOUR LAMP OIL: Purchase Separately Firefly Colored Lamp Oil to Add a Touch of Color to Your Decor. Just a tiny bit will turn your tealights blue, green, purple, aqua, orange, pink or whatever color you like because we provide the 3 primary colors - red, blue and yellow! RECOMMENDED FUEL: Fuel is not included. We Suggest Using Firefly CLEAN Lamp Oil or Firefly Paraffin Lamp Oil. Which One to Choose? Well, our in-house testing showed Firefly CLEAN Lamp Oil burned significantly longer than our paraffin lamp oil and it costs less. Your Choice. Please note, we DO NOT recommend using a flammable fuel such as kerosene or any kind of vegetable oil like olive oil. Great alternative to a kerosene lantern. 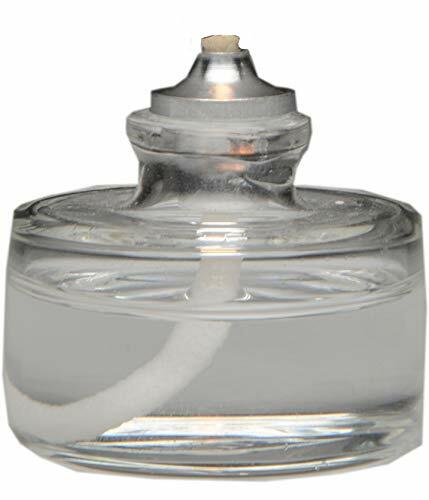 Firefly 3-Ounce Refillable Glass Liquid Candle - Votive Size Emergency Candles - Replacement for Liquid Paraffin Disposable Fuel Cells - Great Emergency Candles.